Amazon has just updated the YouTube app for Fire TV devices, which they make themselves. The updated app now prompts users to load YouTube in the Firefox or Silk web browsers. This appears to be a preemptive move ahead of Google’s decision to block access to YouTube on Fire TV devices on January 1st. The YouTube app for the Fire TV now displays the message you see above and nothing else. It no longer allows you to access YouTube through the app. Selecting either the Silk or Firefox options presented loads youtube.com/tv in each browser. If you select a browser that you don’t have installed, you’ll be taken to the standard app installation screen where you can install the browser. It does not appear as though Google has blocked access on their end yet. If you sideload the previous version of Amazon’s YouTube app on the Fire TV, it still displays the same message informing users that the app will no longer work after January 1st, but the app itself is still fully functional. It appears that Amazon would rather control how the app removes access to YouTube, instead of waiting to see what Google does on their end in a few days. If you want to squeeze out a few more days of using the old YouTube app, you can turn off automatic app updates, so that you keep the old YouTube app, on the Fire TV under Settings > Applications > Appstore. If your YouTube app has already updated to the new version, you can uninstall it and sideload the old app using my Downloader app and entering the URL bit.ly/oldfiretvyoutube. Even though Amazon began selling Google’s Chromecast again and has been in “productive discussions” with Google, it seems as though an agreement between the two companies will not be reached before the January 1st deadline. It’s still unknown to what extent Google will go to block access to YouTube on Fire TV Devices. The primary YouTube app for Fire TV devices has a unique identifier, called a user agent, which is what Google is using to display their message that access to YouTube will be cut off. Accessing YouTube through other means, such as a web browser or other YouTube app, on the Fire TV currently does not display the same warning message. That does not mean that Google can’t or won’t block YouTube access through those other methods on January 1st. We’ll just have to wait and see. Guess that means negotiations aren’t going too well. lol, Terrorist negotiating with Terrorist. They need to put our needs above their profit margin! If YouTube uses open protocols, then wouldn’t Google’s blocking of an application that is trying to access free content be a clear example of a true net neutrality violation? First of all, net neutrality is dead, thanks to FCC. Second, Google is not an ISP, so even if net neutrality were alive, Google is not violating anything. Exactly. This shouldn’t be allowed. Net-neutrality is just like Socialism. In theory everybody working together would be best. But in implementation you always get the USSR, East Germany, Cuba, North Korea, Venezuela & China. Not that I want to wade into a deep net neutrality debate, but I am curious how one sees net neutrality as akin to the USSR, East Germany, Cuba, North Korea, Venezuela & China? Socialism is just another Gov base solution just like NN was. Sure they are not on the same level. But the results just about always makes things worst then make things better. In order to save one egg it doesn’t matter if you break other eggs. You can always fix that problem next. Gov job security. Sure it is funny. Until you own the company that laid your own network cables & then the government comes & says your still responsible for that network but this is how you are going to run it & we got a list of Do’s & Don’ts for you. And no, no new law was pass that says we can tell you what to do. But will re-interpret old laws to say we can. hahaha. Your revisionist history and buying into what Pai said is uninformed, false, and frankly disgusting. Just in reply to your response to me below (for some reason I cannot reply to that comment directly). Time and time again the move toward Title II status for ISPs, and subsequently net neutrality, has not hurt private sector investment in the slightest. Source: https://www.techdirt.com/articles/20141211/05462229389/verizon-admits-to-investors-that-title-ii-wont-harm-broadband-investment-all.shtml and https://consumerist.com/2016/02/09/did-net-neutrality-kill-broadband-investment-like-comcast-att-verizon-said-it-would/ – Unlike the PR firms ISPs have hired in the past to claim that net neutrality kills investment, these companies have a legal responsibility to not mislead investors; these investor meetings have proven that any form of net neutrality regulations put in place have not had any statistically significant impact on their bottom line. 3) Content delivery and distribution amalgamation which saw ISPs not only become the content delivery system but also the content creators – this sparked the ridiculous notion of zero rating where content distributors (ISPs) would not count their content to be counted toward any artificial data cap. 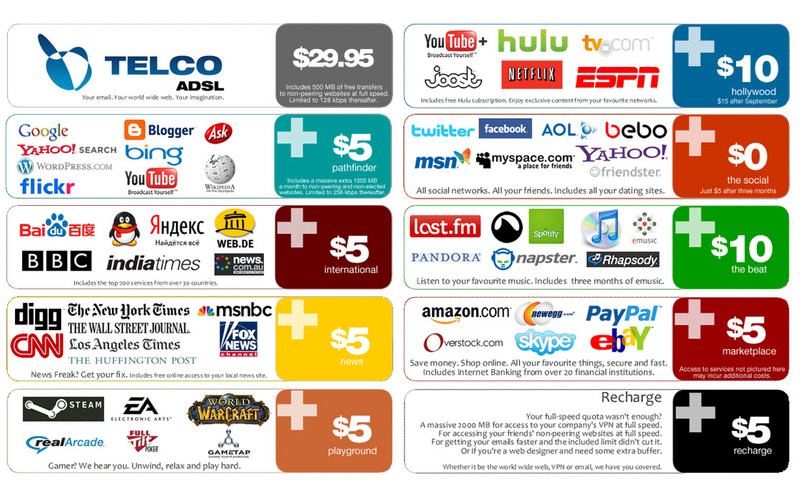 All this say, if ISPs truly want net neutrality to be a thing of the past and offer paid “fast lanes” and “letting the free market decide”, they must first build out what was promised with taxpayer money and not engage in frivolous lawsuits against municipalities who want a truly competitive market. We are getting a taste of what an oligopoly does to manipulate this “free market”; capitalism is great, but only with checks and balances. Alas, the net neutrality check is about to be fully dismantled. Ironically, this was the same argument that Ajit Pai was making except he came to the conclusion that nobody should be limited instead of the logical conclusion that tech companies should play under the same rules as ISPs. It’s very easy to come to Mr. Ajit Pai’s conclusion if you base it on actual history. Before 2015 aka before NN you had the largest expansion of said tech companies. After 2015 aka after NN you had Google & other ISP’s slow down their network expansions since the Gov now said they would regulate them like old time-my phone networks. Government take over of a whole or any industry is never the answer. And it usually creates more problems then it solves. The more ISP’s get to compete on the same market then that competition can take care of any problems NN was suppose to fix. The FCC is only of concern to americans. Both, Google and Amazon, heavily rely on the EU as their second leg. And Google already got a fine of 2.5 bn € before, for exploiting its strong market position (in the view of the EU). I don’t think this is going to help Google in the EU. What the US is doing is becoming less important to the rest of the world than before?? so what does this mean for casting? can you still cast to the fire tv from android/IOS youtube app? and is this going to be a one time popup message where you select a browser this one time and then next time you try and open the amazon youtube app it will seamlessly forward you into the browser youtube page? or will it pop up every time you try and open the app? if the talks with google are going to so badly then why did they just recently allow prime video app into the pay store ? or was tha the trade off for amazon selling CC devices again? Casting no longer works with the new app. You’ll need a 3rd-party solution for that. The browser selection is not a one-time message. It appears every time. You should probably use my Bookmarker apps for permanent redirects to the browser of your choice. This app works great on the fire tv and no commercials. Really nice app. I wish someone would make at least 2 other installable versions of it. Might have to do it myself. I hate logging in to Google Accounts so I just install a different version of YouTube so their preferences get saved locally. Glad I don’t have Updates Auto-Install but I manage them one a per App basis after making a backup of the prior version. No wonder I still get the old school nag screen. Well you’ll have to hit that update app button shortly as google will block your access via the standard ftv youtube app in a few days. Right, but I want to be able to verify they actually block it. Nice game of chicken we got here. I actually use SmartYouTubeTV myself. Someone else in the household uses the Amazon YouTube App. I have yet to be able to find Chromecast on the Amazon website. It’s there, but it’s out of stock. That’s why it doesn’t come up when you search. It’s not like Amazon had them sitting around in their warehouses on the off chance they needed to start selling them, so it takes time before they can actually be sold. You’re usually spot on, but in this case, wouldn’t you think there’s a ton of third party Amazon sellers that would jump at the chance to sell a ton of Chromecasts when Amazon is unable to do so. Problem with not being to exit Youtube when using the FF browser makes Silk the browser of choice. What do you mean by not being able to exit? I came across the same thing. have to force close to get back to FF home screen unless there is a button combo. Can exit by FTV home button, but if you go back into FF it’s still in Youtube if the FF app has not closed yet. If you try to exit the normal way there is no response. I have to hit the home button to exit. The same thing happens here, you can not Exit YouTube when you use FF… If you try to exit the normal way, there is no answer, and you have to press the HOME button to close FF. Currently FF is much better than Silk for YouTube. Following are the two steps to exit YouTube in FF: (1) Press Menu key to go back to FF home page. (2) Then press Back key to exit FF (and YouTube). This does work and Amazon defaults to FF, but not a big fan of the extra clicks. I did confirm that if you leave a video running and follow this method to exit and then return the video is not running, so that’s good. Looks like Youtube in 4k is now a past capability of the Fire TV. All of the videos using either of these 2 browsers now are 1080p. My only problem is that I’ve not yet been able to force the app to play the advertisements that typically accompany Youtube videos. I find this a personal offense, and just as Google proudly used me as leverage against Amazon, I shall dedicate myself to using this previously undiscovered app until I find a way to compel it to display the ads that reimburse Google for all its good works. I was using the silk browser earlier for youtube and it kept on freezing like it was buffering. Didn’t have the on the YouTube app. Internet speed is 80mb. I can see myself getting a nvidia shield tv and binning this now fire junk. No harm in having more than one streamer. Don’t forget Roku. Can’t side load apps, but it does what it does very well. You can actually side load stuff via developer mode, but it’s not Android. What sort of apps can you load that way? They run a pretty tight ship. Thanks! I’m still hoping that someone will emulate the Lenovo tablet/tube speaker concept for FireHD tablets to enable an Echo Show alternative for the kitchen. The kitchen I actually Google’s problem with YouTube on Amazon and specifically in the Show & FireTV, they want to own the instructional cooking market in homes using their new Touchscreen Google Home product. Amazon has put a wrench in that with two touchscreen Echo SKUs and voice enabled $29 FireTV sticks. Agreed. No way to back out of You Tube to FF browser. Totally unresponsive to AFTV remote. Had to hit ‘Home’ button on remote & then force stop in app settings. Would prefer to use FF as SILK is a resource hog & storage on AFTV is limited. Is there a way around this? Although the AmartYouTubeTV APP is great, works flawlessly and removed ads from YouTube, I decided to give it a try to the new Firefox and Silk Browsers for the FireTV. However, there is only one thing that I did not like when I used Amazon’s Silk for Fire TV. Immediately I realized that when I started SILK and accessed http://www.amazon.com for the first time, the name of my Amazon account appeared without me having registered from this Browser! So, when I access amazon.com using the SILK browser, automatically it registers with my amazon.com account!… Something very dangerous because anyone could access my Amazon account and even make purchases from there. Elias, do you know how to disable this annoying function, so that my account is not seen, every time that I enter to amazon.com using the new Silk Browser for Fire TV? not worth the hassle to use a browser. I can access youtube on my PS4 through ethernet, my Vizio Smart Tv, my xbox 360, my crap Roku SE, and even my 11 year old wdtv. It’s up to Amazon to work it out or honestly, back to Roku. And Roku has ethernet cables and usb ports. Firetv stick 2 is my first Amazon device, echo dot my second, but i’m not so invested in firetv sticks that i won’t switch. Especially since that farce of an fire tv they just released with all it’s neutered specs. I picked up a Shield TV when it was at “the lowest price ever” and I’m liking it. I guess it does well with 4k HDR, so that’s a bonus when I buy one of those new TVs. Yeah the Shield works great, just wish Google would make the navigation universal. Instead of having to select onscreen buttons to navigate through some of the apps. I hear you can get around it with a different remote but shouldn’t have to do that. I’ve seen the statement that Amazon is selling Chromecast but I’ve yet to find it for sale there. Are you sure? I wonder the same thing. I have yet to find it. At least you can still cast from your YouTube app on the phone to the Firefox browser on the fire tv. I side loaded Smart TV YouTube and it works just fine. Been using this one and it’s the best solution I’ve seen so far. I agree, it was posted further up and gave it a shot. Its real nice and gives the option to choose video quality from 720p to 4k. I see no reason going back as long as it’s available. It’s likely Amazon would agree, but they probably have to promote a simpler solution for less savvy users. I did that too anyway to change the ugly low res icon it bothers me. I change it too YouTube Red logo. I couldn’t get to fill the screen with APK icon Editor like Amazon icon. So if you can explain how then thanks. Please, could some confirmed if the SmartYouTubeTV APP really works as the Amazon YouTube APP, in the 4K mode on the FireTV 2nd.Gen. 4K BOX? A little off topic but I purchased a MiBox as a Christmas present to myself and I couldn’t be happier. (I also own 2 FTV’s) A search of the popular Android TV forums brings up a lot of negatives concerning the MiBox but I have had zero problems. Many posts claim that Youtube doesn’t work, not true, it works perfectly for me (including casting). Others claim there are wifi connection issues, dropped frames etc. I streamed a 2 hour 1080p movie last night without a single glitch or hiccup. I do not have a 4K TV, I do have “decent” FIOS internet and run everything in my home via wifi,the Mibox is furthest away from my router. The Only “issue” I have encountered is a decent web-browser. I tried side loading Chrome as I was told it would work with the standard MiBox remote but it is a painful experience. Still looking for a browser APK designed specifically for Android TV. The only thing I don’t like about my Mi Box is the company doesn’t really support it. For instance they originally promised Android TV 7 would come out, and it never did. I have not seen an update to the box in probably 9 months or more. I know , I looked into it and had my reservations (but $69 us wasn’t a huge risk for me) I did research and downloaded the Android 7 BETA version to a USB drive but I wanted to run the box through it’s paces on 6 first.So far I have no reason to upgrade to 7. I essentially installed every identical app that I already have on my FTV’s. All(except the web browser)have performed identical to their Amazon counterparts. I’m not a huge gamer, so I can’t speak to the performance of those apps yet, I will try a few in the coming weeks. Try just searching for google chromecast on Amazons site..returns everything but an actual google device. Not an inventory problem for sure. Amazon may have the money but Google has the tech infrastructure. Amazon has gotten too big for its own good. All great things eventually fall and we are witnessing the decline. Stick with what your good at….selling products….and maybe you will survive. firefox works great but what is the problem now, amazon put google products on amazon and put amazon video on google, so what else does google want. I thought amazon refusing to sell google products was the only problem.